[Editor's Note. Those in Chicago who only read the Sun-Times and Tribune, or who get their version of the "news" from TV, have been fed nothing but propaganda against the Boeing workers in Seattle, who just rejected a bad contract offer from management. With Boeing "based in Chicago" thanks to some of Chicago's corporate welfare, the story became a kind of news. But the following story, first reported at Salon, adjusts the news to bring the facts. 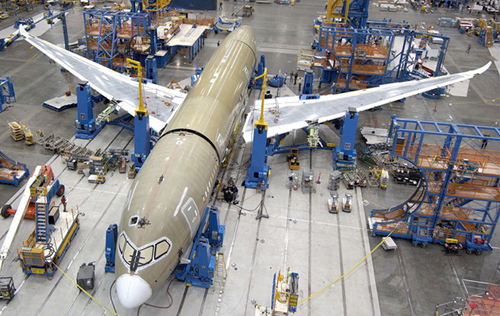 So here is "Bold Boeing Workers Refuse to Screw Over Next Generation" by Richard Kirsch. November 18, 2013. Next New Deal, Salon. Thanks for Portside for bringing it to our attention at Substance. George N. Schmidt, Editor]. Contrary to some of the versions of union current events at large in 2013, many industries are still largely unionized -- and as a result facing the same kinds of attacks teachers and other unionized public workers face. The airline and aircraft industries have been union for more than 60 years, from those who build the planes (above) to those who fly them, maintain them on the ground, or care for the needs of flyers in flight. The same corporate executives who narrow seats and aisles on commercial airlines in the USA (and charge for every piece of baggage) are trying to bust the airline unions, with Boeing among the leaders. Boeing, a corporate favorite of Rahm Emanuel, is also part of the Civic Committee of the Chicago Commercial Club. By rejecting a contract that amounted to corporate extortion, employees have taken a stand for the middle class. In making their case, the members who organized against the contract focused on the fact that they would be giving up "hard fought contract negotiations and strikes by generations of Fighting Machinists that came before us. " They warned, "Boeing is hoping you will deny the next generation many of the benefits we have today." In a remarkable act of courage and solidarity with the next generation, last week Boeing workers in Seattle soundly rejected corporate extortion, by voting down a contract which traded job guarantees for concessions that would severely erode the pay and benefits of younger workers. In doing so, the members of the Machinists are risking their jobs to save an America built on the middle class. The dramatic fight of fast food workers for a minimal living wage, risking their jobs every time they take a day off to demonstrate, is one end of a corporate economy based on low wages, no benefits and no unions. That corporate strategy, aimed at maximizing profits, is destroying America's middle class, wrecking the engine that powered the U.S. economy. On the other end of the middle class are workers like Boeing's, who have fought together through their union for the good pay, pensions, health benefits and job security that characterized the increased prosperity and lowered income inequality of America in much of the second half of the 20th Century. But despite being a hugely profitable corporation, with dominance in the world aerospace market, Boeing is eager to follow the Wal-Mart/fast-food model of the 21st Century economy. Boeing is the aerospace and defense industry's largest company, with its highest profits. In 2012 just the increase in Boeing revenues alone, $13 billion, would be equivalent to the 15th largest company in the industry. With a $319 billion backlog of orders - about 3,700 planes - the company is set for years and is outpacing its only competition, Airbus. Last year, Boeing made $6.3 billion in profits and rewarded its CEO $27.5 million in compensation, a 20% hike from the previous year. Historically, Boeing's Seattle workforce has shared in that wealth. With a 100-year history in the Puget Sound region, Boeing is still the area's largest employer, its 70,000 employees dwarfing the 40,000 who work for Microsoft. Boeing workers are anchors of Seattle communities, both economically and civically. And with good schools and colleges, transportation, and stable communities, the Seattle area has provided key public structures that have enabled Boeing to prosper. But none of that matters � the high profits, the educated workers, the civic history � to a modern corporation that is driven only to maximize profits for its shareholders and pay for its top executives. Boeing moved its headquarters to Chicago in 2001 and decided to build its new 787 Dreamliner in South Carolina, with the first planes rolling out in 2012, assembled by 6,000 workers who earn $15 per hour, almost 50% less than what Washington assembly line workers earn. Early this month, Boeing tried to blackmail both its union members and Washington state. Declaring that it would consider moving assembly of a new line of 777X planes out of state, the corporation asked for mammoth tax incentives and huge concessions on wages and benefits. The Governor and State Legislature caved immediately, passing the largest development tax break for a company in American history, $8.7 billion over 16 years, in a special weekend session. The leadership of Machinists Local 751 also wavered, agreeing to put the contract up for a membership vote, over the objections of most of the union's management council. But then a remarkable thing happened, in an age in which Americans, scared that they will lose what they have left, seem resigned to shrinking pay and disappearing benefits. A grassroots swell of membership opposition to the contract rose up, leading to 67% of the member rejecting the contract. The members did so with their eyes wide open, understanding that Boeing might not be bluffing and despite the fact that Boeing combined bribery with their extortion; the contract would have provided a $10,000 signing bonus to each worker. So why did they show such resolve? In making their case, the members who organized against the contract focused on the fact that they would be giving up "hard fought contract negotiations and strikes by generations of Fighting Machinists that came before us. " They warned, "Boeing is hoping you will deny the next generation many of the benefits we have today." While the proposed contract came with skimpy pay increases and benefit cut-backs for all workers, younger Boeing workers and new hires would have been hit the hardest. Instead of a steady progression to higher wage rates as workers stayed with the company and acquired new skills - which is what Boeing contracts have guaranteed for years - under the proposed contract, recent hires and new hires would be locked into low pay, with glacial increases. The contract would have frozen current pensions and replaced future pensions with a 401K, the defined-contribution accounts that have no guaranteed pay-out and are subject to market risk. Boeing would have been allowed to transfer money from the over-funded workers' pension fund to the under-funded executive retirement fund. Angered at the company's "corporate threats and intimidation," the members declared, "The one thing Boeing can't take away is our solidarity." Unlike Boeing, which has no allegiance to anything but the bottom line, the workers care about their community. As the 751voteno.com website stated, "We must be prepared for a decision they [Boeing] may make and understand that if they take the work elsewhere, they are responsible for that decision. We just could not destroy ourselves in order to keep the company from making a decision that destroys union and non-union workers alike, our communities and the investors." That statement reminds me of a memorable insight I received in the first lecture of a finance class at the University of Chicago School of Business, delivered by Robert Hamada, a future dean of the School. Hamada pointed out that in the class we would be learning how a firm calculates return on investment (ROI), but that there was no reason that the calculations needed to be applied to ROI for shareholders. The same methods could be used to maximize ROI for workers, the community or society at large. As a society, we do not have to accept that the mammoth entities that control so much of our economy should operate just to benefit their shareholders. We can require that corporate decision making take into account its impact on its workers, our communities and the broader economy. That is what unions have done historically and still do at companies like Boeing, which pay high union wages, and in countries that support high rates of unionization. To give workers a say in decision making, German corporations are required to have works councils, which have union members sharing in decisions - which the UAW is now trying to win in a Volkswagon plant in Tennessee - and union representatives have the right to sit on corporate boards of directors. Two years ago there was a huge uproar from conservatives when the National Labor Relations Board accused Boeing of moving to South Carolina in 2009 because of anti-union bias, which is prohibited under the National Labor Relations Act. The Board was roundly attacked for second guessing a corporate decision on where to locate jobs. But the Board's action was based on a Boeing memo, which admitted "the only consistent advantage attributed to Charleston was the ability to `leverage' the site placement decision toward `rebalancing an unbalanced and uncompetitive labor relationship.'" The Board dropped the case after the union and company agreed to a new labor contract, the very one that Boeing now wants to replace with the concessions that the union's members just rejected. Part of the controversy around the Board's decision was its novelty; cases are rare because it is difficult to prove that a company made relocation decisions based on anti-union bias. If we are going to reign in corporate destruction of wages and communities, we should instead imagine a labor law in which corporations are not able to expand into non-unionized facilities and make long-term investment decisions at the expense of jobs at already unionized facilities. These and other changes aimed at giving workers a powerful role in corporate governance are needed to balance the grip that corporate America now has on our economy and democracy. We will find out in the next year whether Boeing is bluffing or serious. Production problems at the South Carolina plant give the union some hope that Boeing might return to the bargaining table, although only after looking to see what they can extort in concessions for anti-union states. But regardless of where Boeing builds the 777X, the fight for an America in which hugely profitable corporations - whether it be Wal-Mart, McDonald's or Boeing - share their wealth with their workers and their communities is just heating up. The bold vote by Boeing workers, like the wave of fast food strikes, are encouraging signs of a new movement of workers, supported by our communities, to build an America that again promises broadly based prosperity. [Richard Kirsch is a Senior Fellow at the Roosevelt Institute and the author of Fighting for Our Health: The Epic Battle to Make Health Care a Right in the United States, published in February 2012 by the Rockefeller Institute Press. In his current work for the Roosevelt Institute and as a Senior Adviser to USAction, he focuses on how progressives can tell a powerful, value-based story about our core beliefs. He also focuses on issues related to creating good jobs and writes about implementing the Affordable Care Act. Mr. Kirsch's blog posts appear regularly on Next New Deal, the Huffington Post, and Salon.